Looking for the perfect night’s sleep? Our collection of single beds are not only stylish but comfortable all at affordable prices. 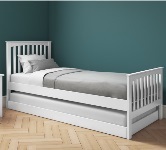 We have a number of styles available ranging from white, oak, pine and metal single beds. Sky White Bunk Bed - Ladder Can Be Fitted Either Side! Dynamo Dark Grey Cabin Bed - Ladder Can Be Fitted Either Side! 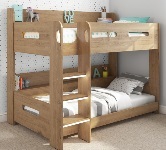 Sky Bunk Bed in Oak - Ladder Can Be Fitted Either Side! Sky Bunk Bed in Dark Grey - Ladder Can Be Fitted Either Side! Dynamo Girls Pink Cabin Bed - Ladder Can Be Fitted Either Side!